Florida freshman Preston Tucker tied the SEC single-game record and established a school mark with 11 runs batted in to lift the No. 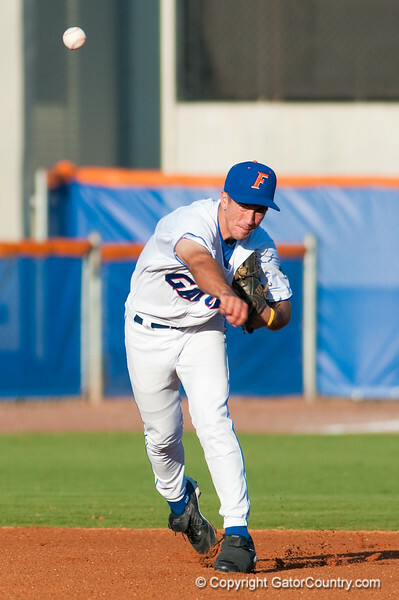 22 Gators (21-11) to a 16-3 win over UCF (11-22) on Wednesday night at McKethan Stadium. The rookie first baseman cranked grand slams in both the fifth (right field) and seventh (center field) innings, sandwiched around a three-run bomb in the sixth to left center. With a 3-for-4 effort tonight, Tucker is an eye-popping .833 (10-for-12) with 20 RBI and six homers over the past three games. His 11 RBI matched the league record total by Jason Nappi of Mississippi State in a 2008 game against UAB and surpassed the previous Gator mark of 10 shared by Avery Barnes (vs. Tennessee, 5/18/07) and Adam Davis (vs. Tennessee, 4/30/05). Tucker became the third player in SEC history to belt a pair of grand slams in a single outing. In addition, he became just the seventh Florida player to hit three homers in game. The Gators (7-5) resume Southeastern Conference action on Friday night in the opener of a three-game series at Auburn (22-10/6-6 SEC). First pitch from Plainsman Park will be at 7 p.m.
Florida’s 13-game home winning streak is its longest since the Gators won 14-straight games at McKethan Stadium from February 21-March 14, 2004. Matt den Dekker’s streak of 29 consecutive stolen bases ended when he was thrown out at third base in the first inning. The last time he had been caught was during the 2007 SEC Tournament by South Carolina. The Gators’ 13-run win is their largest in the series against UCF and was their largest margin of victory for this year. The win by Anthony DeSclafani gives the Gator bullpen 13 of the team’s 21 wins this season. Preston Tucker has hit a home run in three-straight games to become the first player to accomplish the feat since Avery Barnes from April 26-May 2, 2008. Before Wednesday, the last time a Gator player hit three homers in a game was Brian Leclerc against Florida A&M on Feb. 15, 2005.